Has Sonja Morgan Dated These Celebrities? You may be surprised to find out which of these celebs have had a little Sonja in their lives. Several of the RHONY ladies have been romantically linked to nobility, from – duh! – the Count to Prince Casimir of Germany, who dated Tinsley. But did Sonja really dated Grace Kelly's son, the Prince of Monaco? SONJA-YAH she did! Well, at least she *says* she did. And according to Sonja they used to hang out at – where else? – The Regency! Sonja's spent her share of time around Manhattan society, but did she she date New York's famed real estate mogul turned President? That's a Sonja-nah! Sonja IS friends with Trump, but she says it was never anything romantic. That honour, goes to a different Housewife, Kim Richards, who admitted on RHOBH that she and Trump dated back in the day. Over the years, Sonja has been linked to several leading men, but what about Owen Wilson? That's a yes on the handsome Wes Anderson fave. Sonja told Entertainment Tonight she dated Owen after they met through some mutual art world friends. What about the Joker, AKA Jack Nicholson? Was Sonja his Harley Quinn? She was! Sonja confirmed to Housewives head honcho Andy Cohen that she dated Jack, but said it was never serious: "Nobody nails down Nicholson." We've now established Sonja's got a bit of a thing for charismatic actors. So how about Gerard Butler? That's a SONJ-YA! After Paul and Adrienne split, Sonja spent the night with the celeb doctor. She even called him "catnip." We now know Sonja's list includes plenty of famous actors, but what about the sports world? Did she date baseball superstar (and current JLO hubby) Alex Rodriguez? Nope – that was Sonja's co-star Bethenny, who said she "couldn't remember" whether A-ROD was a good kissed. The shade! Here's a curveball (get it? because A-ROD?! K, sorry...) did Sonja date the hilarious Curb Your Enthusiasm star Richard Lewis? She did! And now the two are great pals. We know Sonja likes them young, but she did fellow reality star Shep Rose of Southern Charm? Nah, we just made this one up. But it's totally plausible, right? Alright, here's a different category: rock legends. Did Sonja date guitar master Eric Clapton? She did! Sonja claims they used to "shoot pool" together – and has strongly hinted they did more than that, too. A-ROD was a no, but what about tennis star John McEnroe? She did! Sonja didn't spill any details about her relationship with the tennis star, but we can assume the score was 30-love! Richard Gere is the ultimate silver fox (sorry, Andy Cooper! ), but has he dated the Upper East Side's resident blondie? What about Charlie Rose, renowned broadcaster? That would be a SONJ-YAH! We'll let this Sonja quote speak for itself: "If you see me out to dinner with Charlie Rose, it doesn’t mean I’m hitting that, you know? But I’ve been known to date Charlie, luckily. She did! In fact, it was kind of a scandal: she supposedly dated him at the same time as he was dating English star Perri Lister. 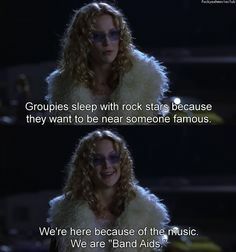 Just don't call her a groupie, she's a Band-Aid, OK? We've covered a lot of bases: sports, cinema, music. Let's give magic a go. Did Sonja date world famous magician David Copperfield?